Welcome to our Stamp of the Month Blog Hop! We will be featuring February's SOTM, which is "Home Sweet Home" (S1302). If you have come here from Judy's blog then you are on the right path! The blog hop is a great big circle, so you can start here and work your way all around. If you get lost along the way, you’ll find the complete list of participating consultants here at Kathleen’s blog. 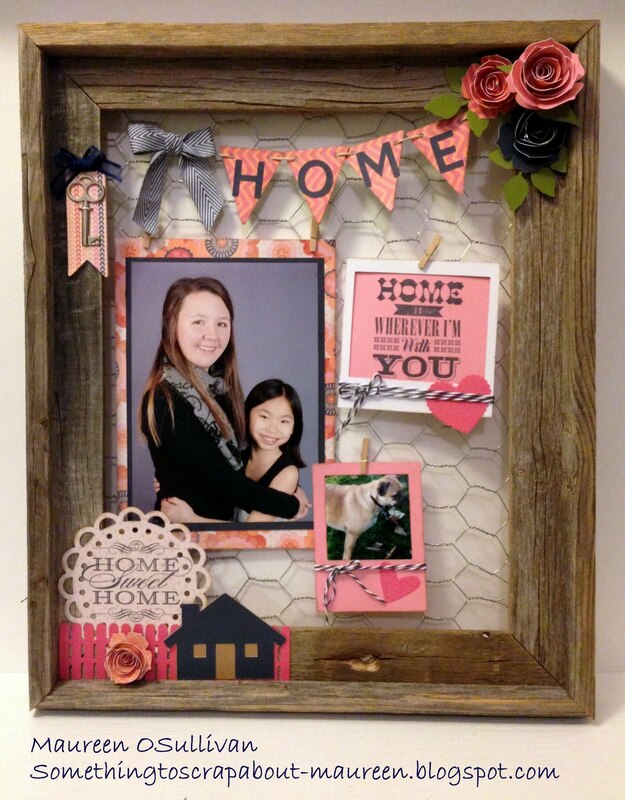 This month we have more that 60 Close To My Heart Consultants sharing their creations using this month's SOTM and other great CTMH products on their blogs. This is simple to do - just click on the link at the end of the post on each blog to move to the next one! Here we go! The February SOTM contains four large stamps. When I saw these stamps, they made me think of my family-- my daughters and dog Rosie:) Rather than do a layout or card, I thought I try something different. 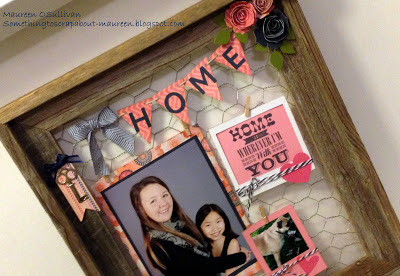 For a while I've wanted to make a 'chicken wire' frame, where I could change out the pictures by just un-clipping them. 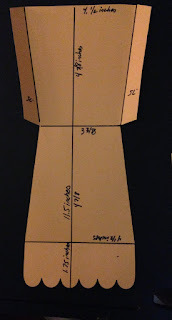 CTMH made this easy because they now carry miniture clothes pins! 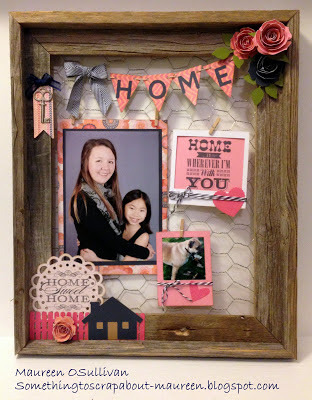 Well, too bad CTMH didn't make 'Chicken wire' Frames too! 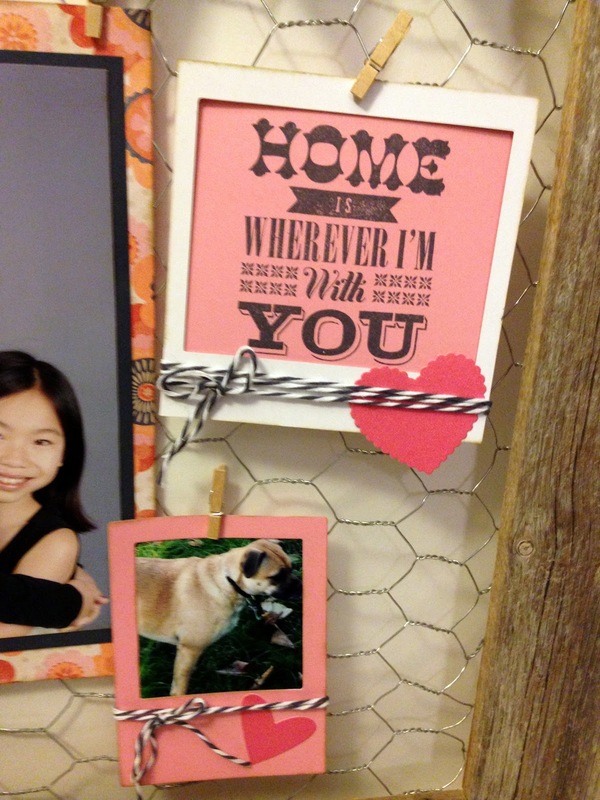 In addition to the frame, I got a roll of chicken wire and a new staple gun (danger!). In the end, I love how it came out. This is truly an altered project for me! 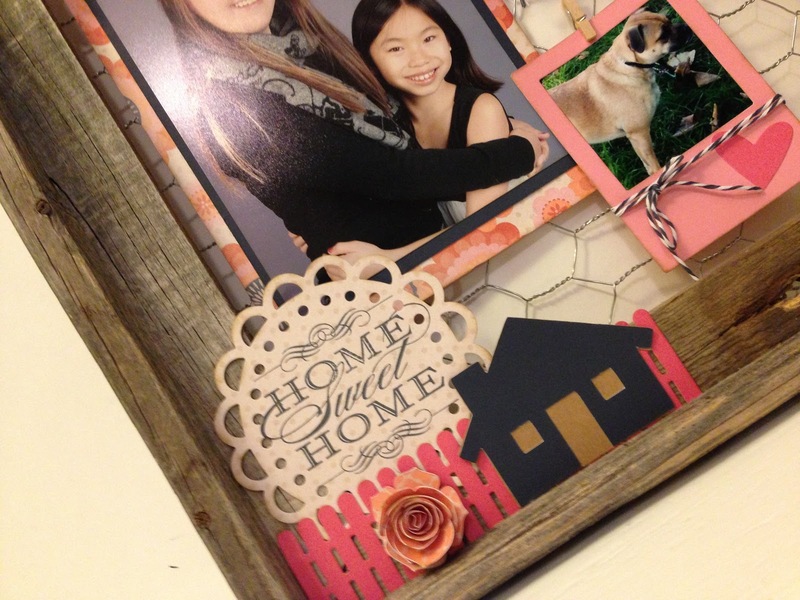 To decorate the frame, I used CTMH's Art Philosophy Cartridge for the banners, 3-D flowers, hearts and house. Is there anything this cartridge can't do? Well, if so, then it's on Artise! Hi, a few people asked for the dimensions for the flower pot. 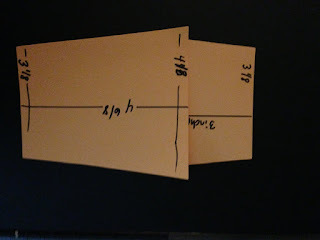 I have to admint that although I am a finance person, I am challenged when measuring things! 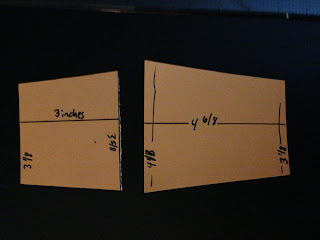 Even when I measure twice, I get two different answers! So this is the best that I can do-- sorry! The shape is 11.5 inches long. The width varies all the way through the pot. The bottom of the pot is 3 3/8 and the top is 4 1/2 inches. For the inside of the card, the flower pot has to be slightly smaller than the card. 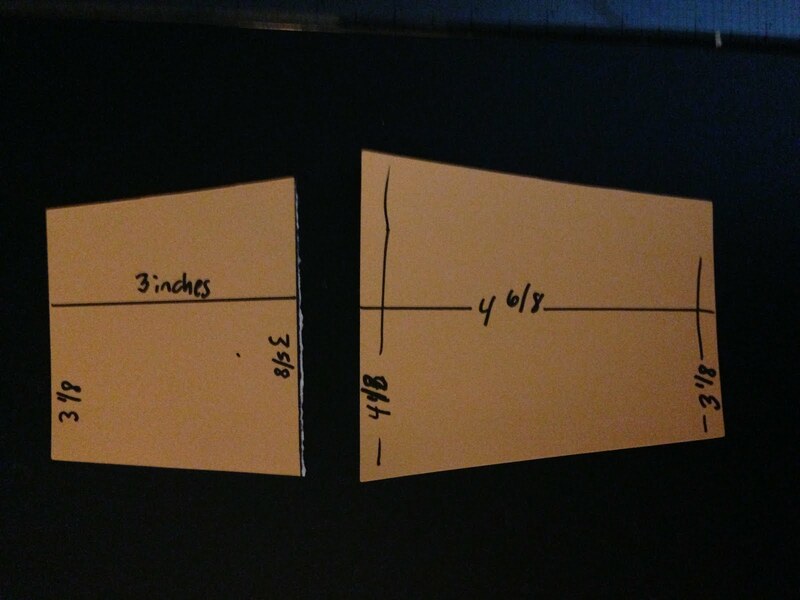 Here I made it 1/8-2/8 less in size so it can fit in the card. To create the flower base, take the smaller shape and tape it to the inside pot. 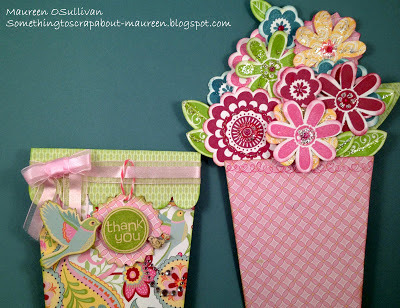 Adhere your flowers to the attached smaller shape. 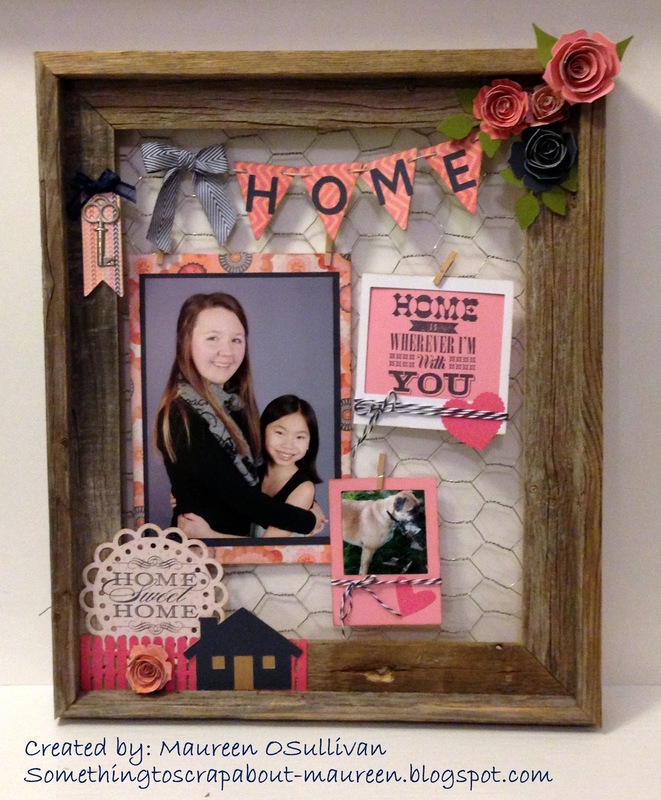 CTMH-- Chantilly and Girls Rock-- Sneak Peek!! I love this time of the year because CTMH's comes out with their Spring/Summer catalog!! All the new products are available to customers on February 1st. However, us consultants can preview the products for the month of January. All I can say is "Wow, the new catalog is awesome!!". 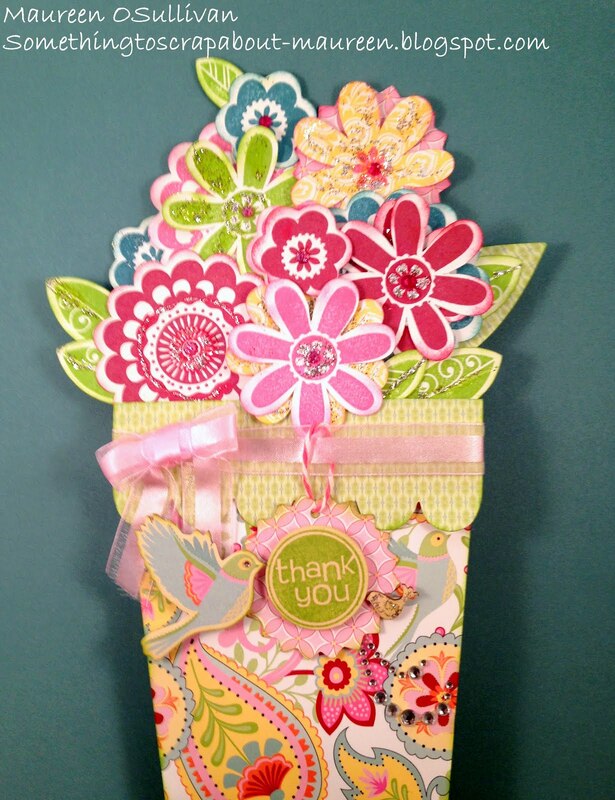 Below is a card that I made using CTMH new Chantilly line. 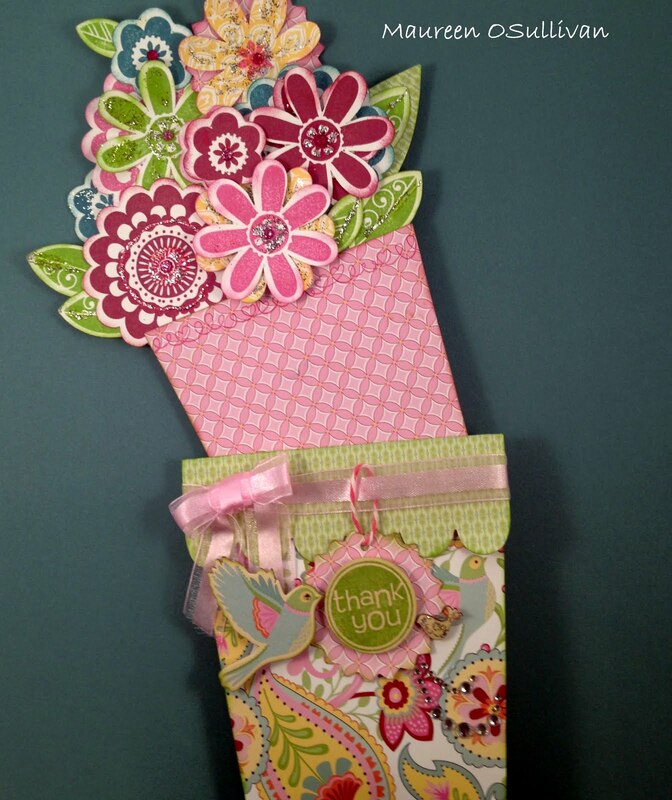 The flowers were cut with the CTMH Art Philosophy cartridge and then stamped with the "Girls Rock" stamp set. All the other items used are listed after the pictures. Hello, it's a chilling morning here in Boston. I have some extra time this morning so I thought I would post one last card using the La Bella Vie paper pack. I made this card last week for my card group that met on Sunday. If you recall this CTMH paper line is retiring at the end of January 2013. What I love about this card, in addition to it being all things French, is that most of the shapes were cut from CTMH's Cricut Cartridges. 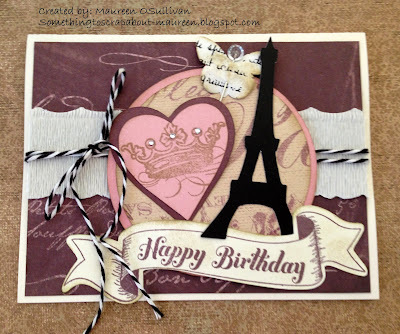 For instance, the circles and hearts were cut using Art Philosophy and the Eiffel Tower and banner using the Artiste. This makes life simple for me-- no dies to worry about! 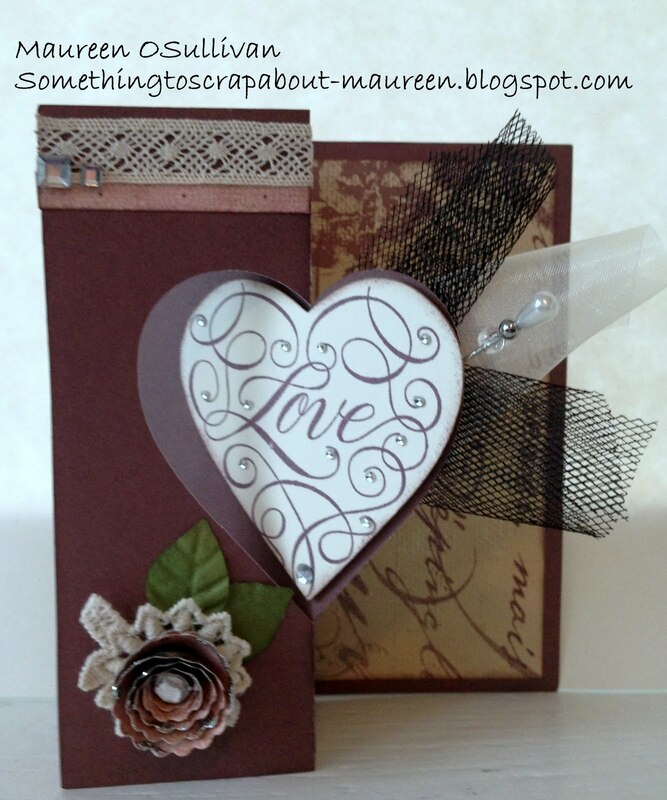 Plus, once the card is designed, it is so simple to replicate. The stamp sets used were 'Bonjour' for the crown and the Artiste stamp set for the HB D-ay sentiment. The inks chosen were Desert Sand and Smokey Plum. While in San Diego, I was lucky to meet the owner of Paper Tales, a local scrapbook store. I shouldn't call it a store because it was more like a boutique-- it had a vintage feel. After I met the owner, Karin, I discovered why the store was awesome. 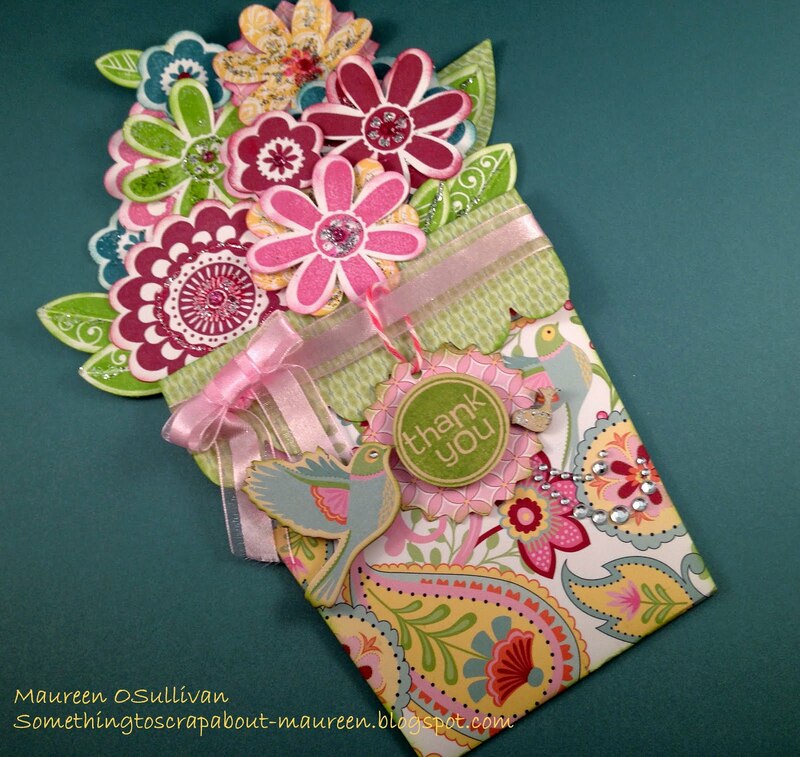 Karin is on the Melissa Frances design team! Karin showed me a number of techniques, one of which was how to incorporate some crepe paper into my design. Here, I just cut out crepe paper and wrapped twine around it. Next time around, I want to dip the edges in sparkly glitter! Always something new to try! Well, I'll be in LA for work in February and I think a drive to Paper Tales in San Diego is on my agenda! Psst-- don't tell my husband:) What happens while (or for) scrapbooking stays in scrapbooking-- something like that! 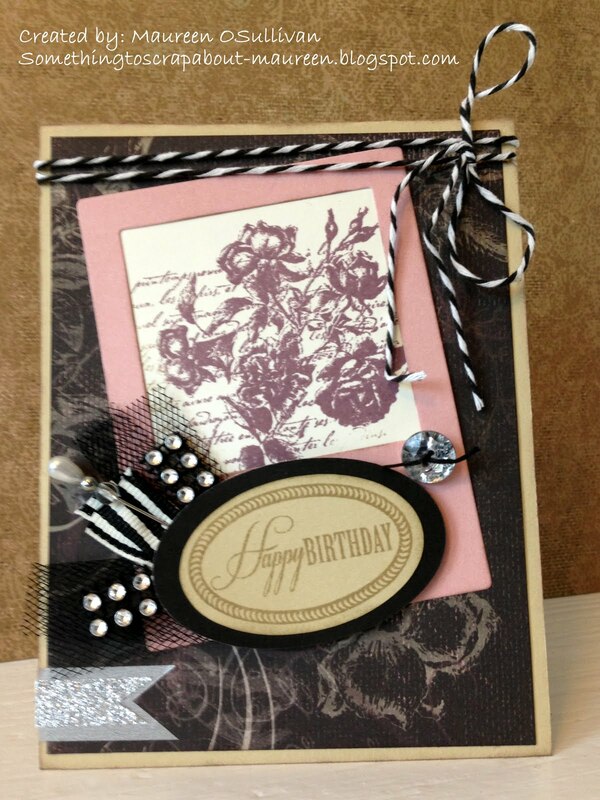 The stamp sets used are from CTMH-- 'Jardin' and for the HB sentiment 'Casual Expressions'. To ink the stamp, I first inked it in Smokey Plum and then rocked the edges in Desert Sand. This created a 2 toned effect. I can't seem to get enough of that Polaroid look, so I cut out a picture shape and placed the stamped image behind it. The paper line is La Bella Vie. If you are in love with this paper, then better get moving because it is only available through the end of January 2013. I better get moving and stock up! Embellishments: Black Tulle (Z1798); Black Striped Grossgrain (Z1781); Silver Shimmer Trim (Z1799); Bling Assortment (Z1466) and Neutral Twine (Z1701). Hi, I've been back from vacation for a week now. A sign of a good vacation is how relaxed you feel afterwards. Well, I'm happy to report that I still feel great!! On to cardmaking, with Christmas behind us it was time to start making Valentine's Day cards. 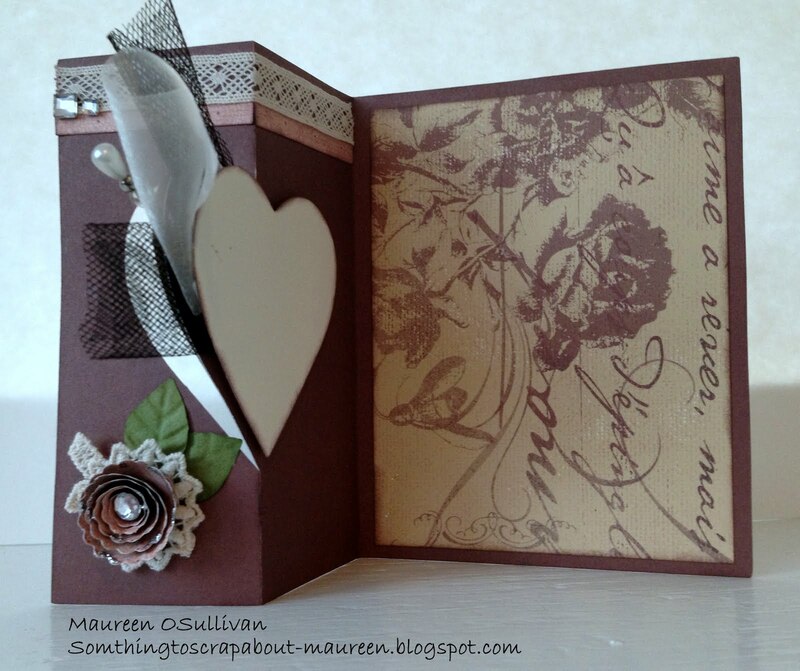 The first one below was made by using CTMH's Artiste cartridge to cut the 'Heart Swing Card'. Artiste cut the card and left score lines for me to fold-- so simple!! I used the 'Love Seal' Stamp and it fit perfectly. All the supplies were CTMH, with the exception of the lace ribbon. 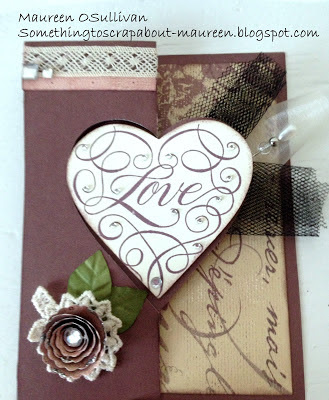 CTMH Supplies: Love Stamp (A1131); La Belle Vie Paper pack (X7158b); Smokey Plum Ink; Black Tulle Ribbon, and Gem Stones.